Michael Kaftori has been with us for two days. 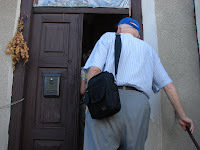 We walked with him through his journey, in Wlodowa and on to Sobibor. Besides the synagogue, Yeshiva and the camp, Jackie and I (Jennifer) were lucky enough to experience his return to his childhood home. The Mayor of Wlodowa was kind enough to offer a car and driver to help Michael with his search. Michael directed us to his original address but the street names and numbers had been changed. When we arrived at the address that Michael had given, he immediately told us that this was not the house. The owners were kind and invited us into their garden. Our interpreter was not with us, and it was difficult to communicate. Fortunately Michael was doing well with his Polish, and was having a conversation with the grandmother of the house. She knew many of the names that Michael was mentioning, and she felt that she knew where his original house was located. She joined us, directing us to his home which was difficult to recognize due to the renovations that had taken place since the war. As we approached the address, Michael recognized it. We were nervous and ecstatic with the anticipation of this meeting. Would the owners of the home be unwelcoming, or would there be no one home? Tzippy entered the yard with brave enthusiasm and walked around to the back door. The front entrance was blocked due to current renovations. As we stood in the back an elderly woman came out to greet us, excited with a puzzled look on her face. After greetings and explanations, she welcomed Michael and his entourage into her home. Michael immediately recognized his kitchen and the stove that his mother used to cook on. The living room had changed but the original wood-burning heater remained. 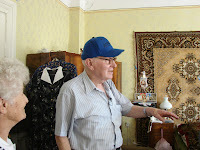 As Michael conversed with the owner, we discovered that she was the sister of the former mayor of Wlodowa. She was not the original post-war owner of the house, but she informed us that Jews had inherited the home after the war they then sold it to another owner. Michael has always felt that the Polish citizens were not welcoming and that Jews were not wanted. Perhaps this experience has helped him to answer some questions. The experience has left Jackie and me with pleasant feelings towards these women who have helped us, but with sadness and a sense of loss for Michael. It reminded us of the loss of his home, childhood and his family. Thank you, Jackie, Jennifer, and Saul, for taking the time during what has to be a most exhausting trip (you're with Tsipy and Jonty, so how can it be not exhausting and stimulating all at the same time?). Your words bring the experience alive for us and will stand as a record for our children, all of whom are so fortunate to be with you.